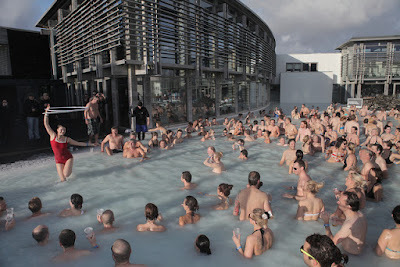 Every year Iceland hosts dozens of music festivals, both in summer and in winter. 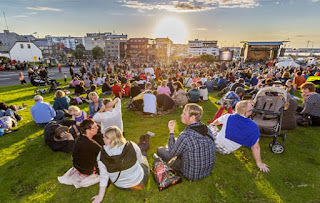 Below is a concise list of music festivals in Iceland, showing you exactly where to go to discover the gems of International and Icelandic music. Sónar Reykjavík offers you the best concerts/DJs in electronic music combined with audiovisual productions from Iceland, and from around the globe. For 3 nights, on 5 stages and with over 70 artists and bands, the prestigious Harpa Venue transforms into a massive nightclub where creative expression through dance is a certainty. Reykjavík Blues Festival takes place at the end of March. 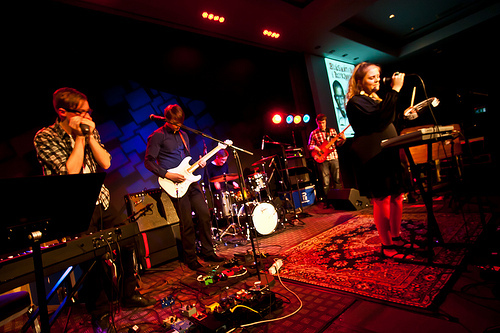 The festival opens with blues concerts in downtown Reykjavík on the first day, which is then followed by blues festivities and concerts at the Hilton Nordica Hotel. Aldrei fór ég suður (I never went south), was set up in 2004 by Mugison, an Icelandic musician. The festival takes place in Isafjörður, in the Westfjords, where Mugison lives, and welcomes the best of Icelandic music. One year Sigur Rós showed up in cowboy hats and performed hillbilly versions of all their old tunes. All concerts are free of charge! 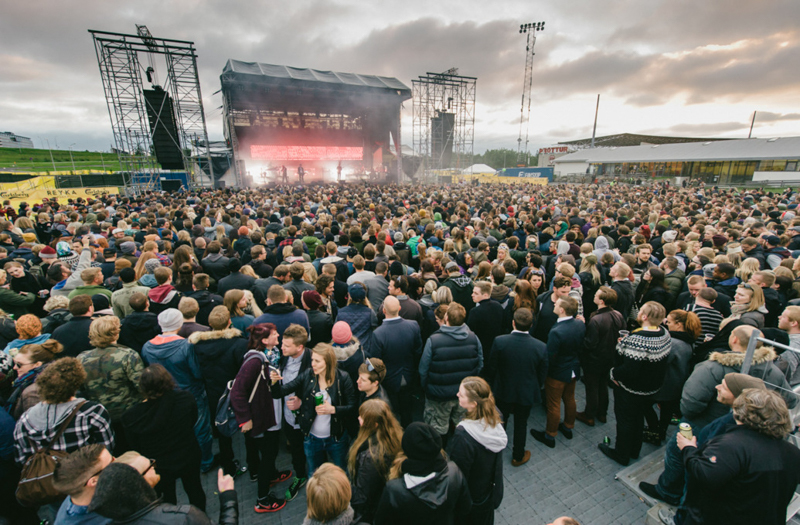 Secret Solstice festival first took place in June 2014. With Massive Attack performing last year, and Wu-Tang Clan this year 2015, the festival immediately became a major popular event. 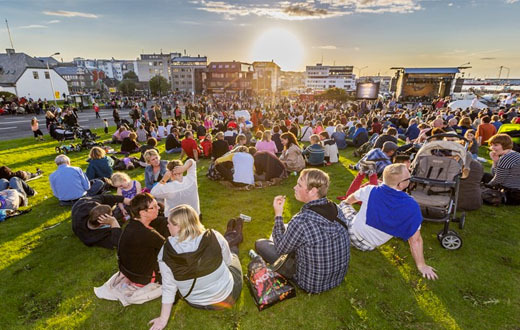 The Secret Solstice is situated in the Laugardalur valley in Reykjavík; it’s been nicknamed Festival of the Midnight Sun, because it takes place over the summer solstice weekend... 72 hours of music, and the sun that doesn’t set... quite a program! 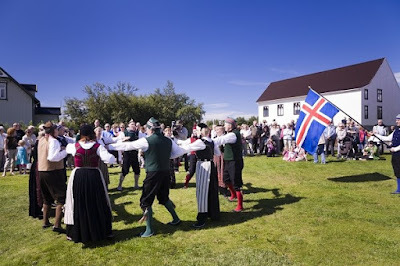 Við Djúpið also happens around the time of the summer solstice, in Isafjörður in the Westfjords. This festival is organised in co-operation with the Iceland Academy of Arts. Traditional music and classical music are on the program, and the festival offers lessons and workshops by renowned musicians. Eistnaflug is a metal music festival running since 2005 at Neskaupstaður and hosts the most popular unsigned metal bands (most of them Icelandic).With more than thirty groups on the agenda, this festival doubles the population of this small town in the Eastfjords. Siglufjörður (folk music festival) begins on the first Wednesday of July and offers concerts, conferences and workshops to promote traditional Icelandic music and Icelandic instruments. Steindór Andersen and Sigur Rós made a noticeable appearance there in 2009. 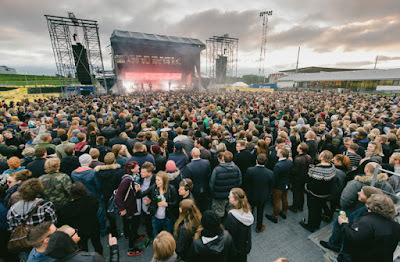 The British festival ATP (All Tomorrow’s Parties), were invited in 2013, to the old military base of Ásbrú, close to Keflavík, and return every year for a few days at the beginning of July. Good quality International bands (Belle & Sebastian, Public Enemy, Portishead, Mogwai, Nick Cave & The Bad Seeds) performed at ATP, as well as upcoming local bands. Amazing concerts, cinema, DJs and other activities have made ATP successful for three years in a row. Iceland Airwaves is without a doubt the most well-known and most popular festival in Iceland. With more than 100 groups and musicians on the program, this festival attracts travellers from all over the world. For five days in November, downtown Reykjavík vibrates to the sound waves of the festival and music can be heard everywhere!